Join MYoga director Ann Dyer for this intermediate yoga practice inspired by the spirit of summer - like a weekend summer retreat stretched over 6 weeks! 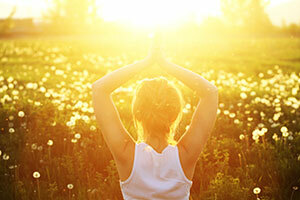 We'll be practicing asana, pranayama, chant and meditation to tap into the free, expansive spirit of summer. Through methodical instruction and the gradual building of skills you will find yourself reaching across familiar boundaries and expanding perceptions with ease. Intermediate Practice is a series taught by MYoga Director Ann Dyer designed for experienced yoga practitioners who are interested in deepening their asana practice, as well as the connection asana plays to the larger tradition of yoga, including the subtle practices of pranayama, chant, and meditation. Held weekly on Thursday mornings, each 6-10 week session focuses on an area particularly challenging for beginners progressing into intermediate level practice. Ann Dyer is the owner/director of Mountain Yoga and a member of the faculty of the Piedmont Yoga Deep Yoga teacher training and Graduate programs. Ann's teaching includes attention to alignment established in her foundational training in Iyengar yoga as well as an appreciation of the energetic body cultivated through other schools of yoga, ayurveda, a degree in psychology and her extensive work in naada yoga, the yoga of sound.